Not all areas of the realm are as sophisticated, however. Wooden bridges and primitive torches are sometimes used in place of stone. 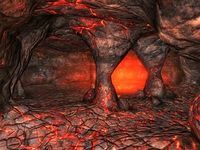 Lava tunnels run beneath the stormy surface, occasionally flooded with magma or toxic gases, but often incorporated into structures and used as a means to traverse the landscape. 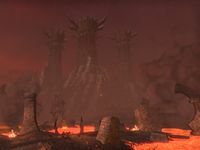 As such, these caves are inhabited with just as many Daedra as the surface, and Harrada roots often break through. Cruel traps are employed both inside the towers and around their exterior. Magical land mines and fire towers protect the keeps from outside invaders, while devious mechanised traps await those who find themselves within. Lord Dagon rules the realm, but his servants follow a warlike, patriarchal hierarchy. The Kyn act as the Prince's chief servants. Closest to Dagon is the Valkyn, his personal guard. The Valkynaz serve as commanders of operations of particular importance to Dagon, but usually stay by his side. Below the Valkyn is the Markyn, Mehrunes Dagon's Council of Lords. A Kynmarcher is the lord and high officer of a citadel, outpost, or gate; he controls both a clan fighting unit and a fief, a territory for which he is responsible. The lowest ranked Kynaz are Churls, who are undistinguished rabble ferociously cruel to mortals and other Daedra but obsequious to their superiors. The many lesser Daedra of the realm are thought of as unthinking animals. Clan Dagon is the main clan of the realm, but other lesser clans and castes are also represented. Dremora Clan, Xivilai's Clan and Shardai Clan are three of the more prominent; all three are administrated from the Havoc Wellhead. Clan politics were upset during Dagon's invasion of the Battlespire, when Dagon allied with the clanless Mazken, and took a Dark Seducer as his bodyguard and lover. Balance was restored when Imago Storm of Dremora Clan allied with a mortal hero and temporarily took control of Clan Dagon after the hero banished Faydra Shardai, Xivilai Moath and Mehrunes Dagon to the Void. 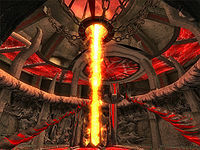 In the events leading up to the Imperial Simulacrum, the traitorous Jagar Tharn struck a deal with Mehrunes Dagon: in return for his aid in Tharn's plan to take over the Third Empire, Dagon was promised the Battlespire, the magical academy of the Imperial Battlemages which was located in a thin slipstream between Oblivion and Mundus. Dagon successfully invaded the Battlespire during the simulacrum by traveling through multiple realms linked to the Battlespire's Weir Gate. An apprentice battlemage survived the assault, and followed the retreating army through Oblivion. Another apprentice was sent to the Battlespire as a scout, but further reinforcements were blocked by a Daedric sigil placed on the Weir Gate. Following the trail left by the previous apprentice (who had been captured by the Daedra), the hero arrived at Dagon's Hunting Lodge. This section of the Deadlands was haunted by the ghosts of mortals who had sworn to serve Dagon for eternity. The lodge itself was the domain of Dagon, where the Prince was keeping the captured apprentice hostage. Using the Broadsword of the Moon Reiver, the Cuirass of the Savior's Hide and Dagon's neonymic, the hero banished the Daedra Lord to Oblivion and rescued the fellow apprentice. With its creator's banishment, the Lodge crumbled; the Battlespire was also destroyed, and its link with Oblivion severed. In 3E 433, Mehrunes Dagon launched an all-out invasion of Nirn. The Mythic Dawn assassinated Emperor Uriel Septim VII and all of his legitimate heirs. 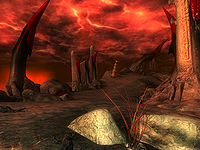 Without the Dragonfires to prevent permanent liminal bridges, the Mythic Dawn was able to create stable portals to the Deadlands, from which Daedra could invade. The Oblivion Crisis began with the sacking of Kvatch, when the Mythic Dawn opened a Great Gate to allow a Daedric Siege Engine to break through the city's defenses. The city was left to burn, with a single Oblivion Gate blocking its entrance. The Kvatch city guard, led by the Hero of Kvatch (and in some versions of the story, by Martin Septim), stormed the Oblivion Gate, which linked to a region of the Deadlands called Ganonah. The force made their way to the Sigil Tower (named the Blood Feast), which housed the Sigil Stone that kept the Gate open. By removing the Stone from its place in the Sigillum Sanguis, the Tower and Gate were destroyed and the force was teleported back to Mundus. Armed with this information, many more Oblivion Gates were closed. The Imperial Legion were responsible for closing the Gates at Ione and Fort Sutch. The Knights of the Thorn attempted to close the Gate outside of Cheydinhal, which would have ended in disaster were it not for the intervention of the Hero of Kvatch. The Mythic Dawn's efforts to sack Bruma was discovered by the Blades; in response, the city guards were taught how to close the Gates, and the other Cyrodilic cities sent reinforcements once the threat of Daedric attack was neutralised. In a daring move, Martin Septim allowed the Mythic Dawn to open a Great Gate in order to retrieve its Great Sigil Stone. Leading an army against the Daedra, the Battle for Bruma was a victory. Although Cyrodiil was the center of the invasion, the other provinces fared much worse. The Old Holds of Skyrim and the town of Ald'ruhn on Vvardenfell were burnt to the ground. 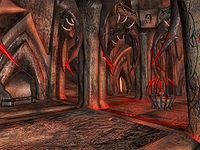 The Legion was stretched thin; despite the best efforts of the Telvanni mages, the Gates in Morrowind could not be suppressed. The Hist called many Argonians back to the Black Marsh, where they poured into the Deadlands in such numbers that the Daedra were forced to close the Gates. Vivec was rumored to have been taken by the Daedra, while Saint Jiub was killed. With each Gate that was opened, the liminal barrier was weakened, until eventually Mehrunes Dagon himself came through into Mundus for the first time since the First Era. The crisis ended when Martin shattered the Amulet of Kings and turned into the Avatar of Akatosh, defeating Dagon in a final battle in the Imperial City's Temple of the One. This sealed the liminal barriers permanently, preventing any future invasion.